THE LATE ALDO ROSSI MAINTAINS CITIES DEVELOP SLOWLY in a complex historical and social context. He was among the first in his generation to consider old things with new eyes. Nothing could be further from the aspirations of the previous generation of Modern architects and urban designers. They were obsessed with the new and the heroic. They repressed, or entirely blocked out, existing built environments, modes of thought and action that through their process of elimination, celebrated the innovative and different at the expense of developing coherent relationships with longstanding built environments. Much has happened since Rossi and his contemporaries triggered a renewed look at the potential of context and the role of everyday built environments. In particular, we continue our fascination with novelty and at the same time hurtle further towards ecological and social peril, often exacerbated by such newness. Because of this there is a sense, at least for some, that the cult of "the new," (ironically now over one hundred years old), is losing its steam. If one agrees, innovation is better when it is evolutionary rather than revolutionary. This is the case for architecture and urban form because it, though made of ordinary material, considers a complex range of issues, among the most important being various fields of circumstance: spatial, cultural, technical and ecological among them. Both architecture and urban form commonly do this at a specific range of scales; from the constructed connection, to the building and the city. As recently as eight years ago, even Rem Koolhaas, for some an avatar of a dystopic neo-liberal future, began to inquire about the presence of the past in the contemporary built environment. His 2010 Biennale exhibit "Cronocaos", appeared to epitomize this change of heart by being an inquiry into the relationship between preservation and development, asking among other things, "What do we save and what do we destroy?" THE ROLE OF CONTEXT IS A BIG ISSUE addressed in the 2018 Venice Biennale, co-directed by Yvonne Farrell and Shelley McNamara. The pair are partners of the Dublin based practice Grafton Architects. "FREESPACE" is the title for the six-month event that attempts to describe architecture's ability to be generous, enhance well-being and give dignity through its capacity to offer space, light, air, privacy and publicness. The Biennale's myriad of exhibits accomplishes this by making compelling connections to larger, geographical, urban, historical and social contexts. Like Rossi, Farrell and McNamara see cities as both evolving and interactive shared material and cultural systems. Unlike Rossi who reads cities as a morphology of building types, Farrell and McNamara describe their work as "geologic" form that is part of a larger ever-mutable urban terrain made of a shifting syntax of social and physical geographies. Whether collectively symbolic or quasi-topographic modeled mass, both Rossi and Grafton Architects seek to position architecture in a larger and responsive context of complex human capabilities. At least three exhibitors at the Biennale argue that renewed existing space is indeed a form of Freespace as Farrell and McNamara describe. "Rebeauty: The sustainable transformation of Albertslund South," is an exhibit in the Danish Pavilion who's overall theme is the "Power of Collaborative Innovation." "Redefining the Rural," a video by Joshua Blochover and John Lin's in China's Pavilion, whose overall theme is "Building a Future Countryside" and Lacaton & Vassal's exhibit, "Freedom of Use" in the Gardini's Central Pavilion, are two additional exhibits that examine the renewal of architectural elements and space as they apply to the Biennale's theme. All three deploy video to illustrate architectural qualities that are more difficult to understand if left to using only conventional drawings, photos, models and text. The acclaimed video artist Bill Viola states that, "...the essential basis of video is movement; something that exists at the moment and changes the next moment." One could say that cities do the same, just more slowly. For social, political and economic reasons urban environments physically transform from one era to the next. For each of the fore named projects, video depicts such transformation: telling a story of change in a built environment. Through timed sequence and montage, these recordings concisely interweave the often dense and interconnected factors an architect must consider when designing buildings and space in an existing place. In addition to video's ability to illustrate change over time, it is also important to consider its increasing influence is a function of the relative low cost of the equipment needed to make it and the powerful platforms used for its distribution. YouTube, Vimeo and other web-based platforms provide an accessible system that can quickly expose underexposed ideas and nuanced perceptions to broad audiences around the world. Its affordability coupled with open distribution give video and the ideas it represents a life beyond a particular place or event. Because of this, the discussion of Farrell and McNamara's themes can now continue beyond the event's November 2018 closing date. VIDEO'S ABILITY TO EXPOSE THE LATENT POTENTIAL OF CONTEXT is in the Danish exhibit about Albertslund South; a modern housing community built in the mid 1960's. This low-rise Danish Modernist interpretation of an English Garden City is also a reaction against the high-rise social housing projects of the era scattered across the urban peripheries of Europe. Innovative for the time, the community was initially very popular with its new residents. Designed by architects Faellestegnestuen (1963-1968), it is composed of single floor houses and gardens, the latter intended to supply the new settlement with food. The low-rise city made of prefabricated concrete panels is surrounded by farmland that buffers the expansion of Copenhagen. In later decades, Albertslund began to show its age and became emblematic of what was wrong with postwar modern housing; ecologically inefficient, overly uniform, anonymous and boring. 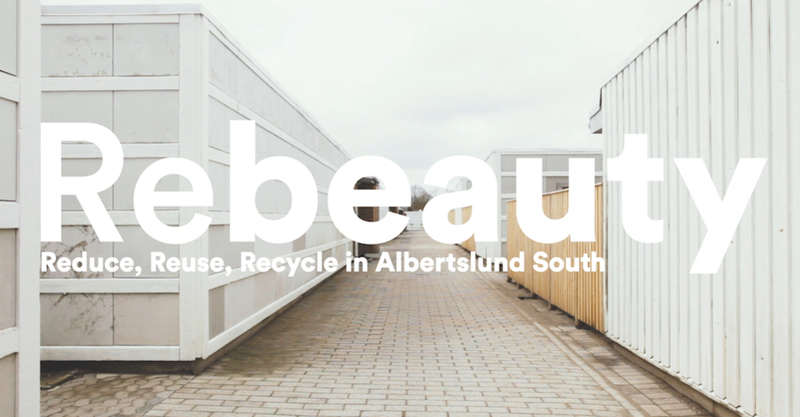 The video "Rebeauty: The sustainable transformation of Albertslund South" by "Vandkunsten Architects" and edited by Julie Hunæus Reuter, claims that the most sustainable action we can make in the built environment is to reuse the existing environment. Taking advantage of its low-slung character, the renovation of the community modifies its prefabricated units and individual gardens. The addition of a new 40 cm layer of rigid insulation improves the thermal performance of the existing walls. The thickening of the paneled wall allows for deeper three pane window frames that perform better thermally. New skylight and solar units installed atop the flat roofs add daylight to the center of the unit as well as heat water and generate electricity. The most architectural strategy of renewal lays in the project's re-composition of existing building materials from the original buildings. These metamorphosed systems not only enhance thermal performance and reduce the projects carbon footprint but also elaborate its tectonic expression. The original prefabricated concrete structure was stripped down to yield a pallet of old but reusable materials, that include wood flooring, aluminum trim, steel studs, flattened pipes, clay tiles and sliced hollow core concrete slabs. These repurposed elements make various types of new cladding, garden screen walls and exterior pavers. Old windows are saved and grouped together to make playful glass window-walls for cafes and other public spaces. The architects claim all of these new systems made of old materials can be disassembled, reconfigured and reused or recycled at the end of their useful lives again several decades on. Albertslund's renewal relies on reuse but also the re-composition and reconsideration of beauty itself as it relates to economic, environmental and cultural criteria. A SECOND VIDEO THAT FEATURES THE REUSE AND RENEWAL at the scale of building materials and building was Joshua Blochover and John Lin's video "Redefining the Rural." This work by "Rural Urban Framework (RUF)" is part of the overall pavilion theme, "Building a Future Countryside," that critically considers the future of rural China. Like many cultures, the Chinese countryside is viewed by many nostalgically, a place of beauty, tradition and cultural continuity. The rapid modernization of China threatens this. This change effects buildings as well as economic and social relations in rural areas. The exhibit explores the potential of vernacular building culture in modern life. The Blochover and Lin video illustrates this challenge and opportunity by focusing on the construction of a cylindrical tower, a small theater and public space made of wood from abandoned structures. The aging wood elements do not recreate the way things were but how they can be. Access to the top of the six-meter tower is through a slow wooden spiral stair that acts at the lower levels as an interior bleacher for small groups to view films and videos. 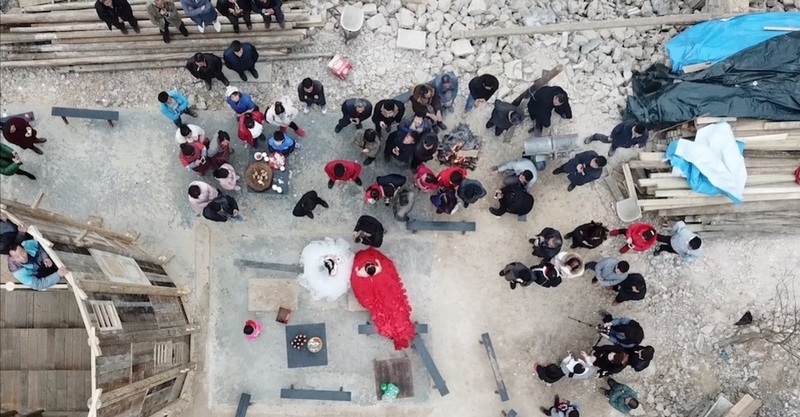 Set in the village of Huanghe in Yunan province, the wood tower becomes a public backdrop for village rituals such as weddings and other informal gatherings. It is a new and shared monument made from the aging structures of the past. Like the Albertslund South project, the raw material for new construction comes from older buildings. A sort of rebirth through reconfiguration. Unlike the Danish project, the Huanghe tower is not as much about finding the aesthetic potentials of patterned recycled materials. Rather, it fits into an ancient and often violent process more common in Chinese urban history characterized by urban erasure and reconfiguration meant to valorize a new era of political and related urban development. The material of Huanghe's historic buildings literally are its future DNA, resurrected in a cultural cycle of destruction and rebirth. This pattern is distinct from those found in Europe based on continuity and transformation with a given urban history; this coherence results from a typological or formal morphology of the city's fabric. Nonetheless, the Huanghe project is not, like much of China's recent urban development, Modernist in sensibility, erasing its context and building upon a new and historically disconnected tabula rasa. It is puzzled into an existing town, employs reused materials from the site and as such is a commentary on the culturally indifferent development of rural and urban China of the last three decades. Made of old building elements, the new Huanghe tower attempts to evoke an older rural culture that people miss. The work of French architects, Anne Lacaton and Jean Philippe Vassal tries to find a new beauty in a building type that is widely reviled, the mid-twentieth century housing block. Founded in 2004 along with Frédéric Druot, the pair are leaders of the PLUS movement conceived as a response to the mass demolition of social housing projects in France. With the motto, "Never demolish, never remove or replace, always add, transform, and reuse! ", PLUS argues instead to renovate the extensive public housing projects of second half of the twentieth century. Their designs remove aging exterior skins and partitions from their perfectly functional, even elegant, concrete frame and slab towers. They replace the exterior cladding with energy efficient envelopes of various levels of transparency, made of mostly floor to ceiling glass that reveal the concrete frame and let in abundant natural light. The neutrality of the structural grid and the building's layered skins permit a variety of programs to coexist and better inter-relate within the housing slab. This not only animates what formally was a dull building type, but also creates spatial connections that did not exist before that result in new stronger social relationships between residents and their larger neighborhood. THE LACATON & VASSAL VIDEO IN THE BIENNALE'S CENTRAL PAVILION, "Freedom of Use," is immersive, featuring a slow sequence of stills and superimposed text projected over the entire height of the gallery wall. The large scale of the projection allows one to understand the size and character of the renewed spaces composed of open stripped-down concrete slabs and columns. The short video recalls a longer montaged interview made a year earlier entitled "Imaginaires de Transformation: Lacaton & Vassal et Frédéric Druot" by "Karine Dana". Its' twenty plus minute length allows for a more in depth description of the transformation of a specific housing project, Cité du Grand Parc in Bordeaux (2016). The video, structured through an interview of Druot, Lacaton and Vassal, outlines their design principles that attempt to provide spaces that encourage individual modification and contributes to a compelling everyday poetic found in urban housing. The video illustrates this ignored capacity through tranquil shots of large domestic spaces that are functionally flexible, filled with daylight, open to sweeping city views and all abstractly framed in spare concrete. 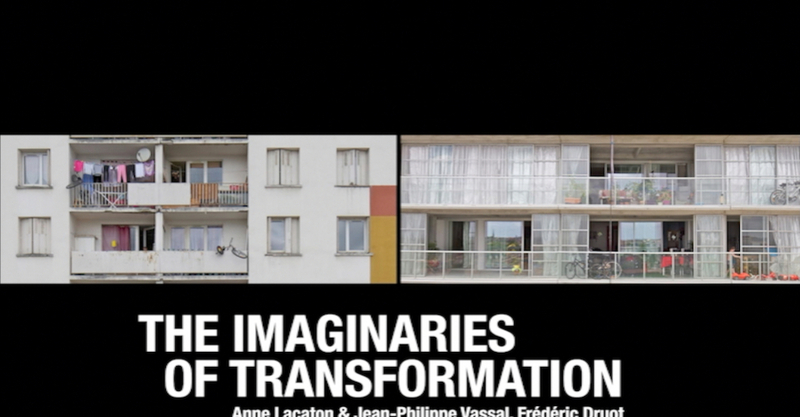 "Imaginaires de Transformation," begins with grim but reflective stills of the original dingy over crowded apartments that are poorly lit by small punched windows. For € 45,000 per unit, Lacaton & Vassal add a sleeve of terraces to the rectilinear housing block that, after removing the original windows and exterior wall panels, leaves in its place a vast panoramic balcony that brings in the sun and connects the interior space to wide views of the city. The urban setting and its renewed buildings are what Lacaton & Vassal call a "collection of capacities" made of an aggregation of activities and spaces to live in, not, as many taller buildings, merely an "inert mass for modeling." The spatial generosity they offer through the renovation of social housing becomes, in their mind, the critical starting point of enhanced social life. For Lacaton & Vassal, the right to munificent habitation is political. The Lacaton & Vassal projects literally are a reconsidered framework for the dynamic plurality of the city. The firm's reuse of the monumental modernist housing blocks is a contemporary remix of Rossi's reading of the city as something rehabilitated and transformed over time. At the scale of city, rather than reused raw materials of disassembled buildings, Lacaton & Vassal reconsider the city and life in it by the renewal of an unloved building type and the postwar social project that many want to forget. WHETHER WE ENABLE OR DISMISS OUR ARCHITECTURAL AND URBAN HISTORIES, the shared argument of these three exhibits focus on the inventive potential of the existing. Unlike, previous neo-historical eras that attempt to reclaim old forms to restore or establish new identity through recognized symbols, these projects build new character with older raw material. This allows the projects to be both ecologically sustainable and make connections to cultural contexts that speak to a more positive future. Farrell and McNamara argue that such optimism, while challenging to deliver, is a responsibility of architectural and urban design. The FREESPACE themes of well-being, generosity and dignity through the fundamental architectural qualities of space, light, air, privacy and publicness are the elements they use to meet this necessary task. It behooves all who design built environments to continue to consider this essential menu as well. The aesthetic of efficiency: the renovation of 1001 atrium houses of Albertslund South. Shown at the Danish Pavilion at 16th International Architecture Exhibition of La Biennale di Venezia (2018) "Rebeauty" is the quest for new aesthetic building components made from preused materials. The video presents the renovation of 1001 atrium houses of Albertslund South built in 1970s: to complete such a task, Vandkunsten Architects proposed a renovation strategy based on a hypothesis of three types of available resources: economy, energy, and culture. "This low-rise Danish Modernist interpretation of an English Garden City is also a reaction against the high-rise social housing projects of the era scattered across the urban peripheries of Europe" noted Lawrence Davis. "Innovative for the time, the community was initially very popular with its new residents. Designed by architects Faellestegnestuen, it is composed of single floor houses and gardens, the latter intended to supply the new settlement with food." However, time has proven this housing projects to be ecologically inefficient, overly uniform, anonymous and boring. In 2012 a competition was carried out to find new solutions and new ways to reuse the dismantled buildings of the social housing estate: different proposals were submitted. The Albertslund South renovation started in 2014 and is still in progress and will be completed in 2022. "Rebeauty" short film explains a new metamorphic system that would renovates the prefabricated units through the use of reused and reusable materials, such as wood flooring, aluminum trim, steel studs, flattened pipes, clay tiles and sliced hollow core concrete slabs, that would not only enhance thermal performance and reduce the projects carbon footprint but also elaborate its tectonic expression. The Vandkunsten Architects' videos is simple yet straightforward: through the presentation of the Albertslund South's units, it points out the weakness and the possible solutions to its problems. Minimalistic, clean images - symmetric views, still frames - of the residences interlaced with texts, that works as a recap, are presented next to the reusable materials chosen by the firm (shot in studio, an aesthetically pleasing vision that gives a spin to how we think about the "recycled" stuff), to design a new space, more ecologically efficient and aesthetically various. Responding to the "Freespace" theme for the 2018 Biennale di Venezia, co-directed by Yvonne Farrell and Shelly Mc Namara, this video was created by Vandkunsten Architects under the art direction of Julie Hunæus Reuter, together with the editorial team formed by Anne-Mette Manelius, Asbjørn Staunstrup Lund and Salma Zavari, for the installation Rebeauty, part of the Danish Pavilion at the 16th International Architecture Exhibition of La Biennale di Venezia 2018. Danish Pavilion overall theme is the "Power of Collaborative Innovation".